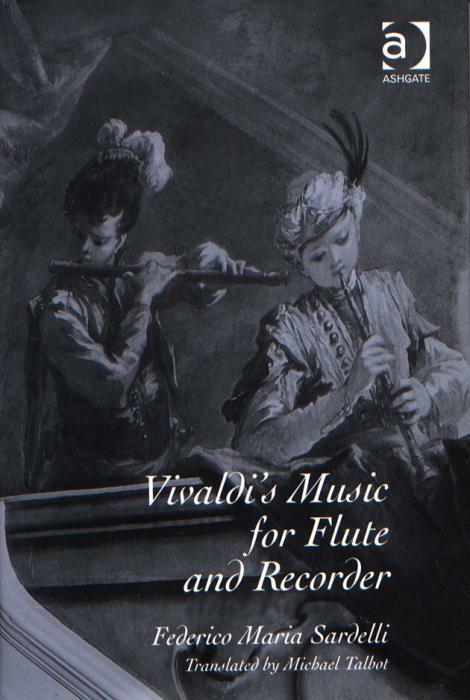 Vivaldi’s Music for Flute and Recorder, Aldershot, Ashgate, 2007, 316 pp. Federico Maria Sardelli writes from the perspective of a professional baroque flautist and recorder-player, as well as from that of an experienced and committed scholar, in order to shed light on the bewildering array of sizes and tunings of the recorder and transverse flute families as they relate to Antonio Vivaldi's compositions. Sardelli draws copiously on primary documents to analyse and place in context the capable and surprisingly progressive instrumental technique displayed in Vivaldi's music. The book includes a discussion of the much-disputed chronology of Vivaldi's works, drawing on both internal and external evidence. Each known piece by him in which the flute or the recorder appears is evaluated fully from historical, biographical, technical and aesthetic standpoints. This book is designed to appeal not only to Vivaldi scholars and lovers of the composer's music, but also to players of the two instruments, students of organology and those with an interest in late baroque music in general. Vivaldi is a composer who constantly springs surprises as, even today, new pieces are discovered or old ones reinterpreted. Much has happened since Sardelli's book was first published in Italian, and this new English version takes full account of all these new discoveries and developments. The reader will be left with a much fuller picture of the composer and his times, and the knowledge and insights gained from minutely examining his music for these two wind instruments will be found to have a wider relevance for his work as a whole. Generous music examples and illustrations bring the book's arguments to life. Preface; Translator's note. Part I The Recorder and Flute in Italy in Vivaldi's Time: The emancipation of the recorder and flute; Straight and cross flutes; The recorder and flute in Venice: the rôle of amateur players; The recorder and flute in Venice: the first professional players; Other players of the recorder and flute associated with Vivaldi; Missing workshops and instruments. Part II Vivaldi's Music for Recorder and Flute: Vivaldi's sonatas for recorder and flute; Vivaldi's chamber concertos with recorder or flute; Vivaldi's flute concertos; Vivaldi's recorder concertos; Vivaldi's concertos for flautino; The concerto for two flutes; The concertos with multiple soloists and orchestra; The recorder and flute in Vivaldi's vocal music; Remarks on instrumental technique; Conclusions; Postscript: a late discovery; Inventory of the works for recorder and flute by Antonio Vivaldi; Bibliography; Indexes.